Randy and I have sort of a don’t ask/don’t tell approach to my cookbook collection. As in, don’t ask me if I have bought any new ones lately and I don’t tell you. Sometimes eyebrows are raised. Sometimes mental measurements are taken on the diminishing space on the “overflow” shelf. Sometimes heads shake. As in, no, no, no, not another one. But here is the thing. I am kind of a girly girl. I like to dress up and I like nice things. I could very easily be collecting shoes or purses or expensive perfumes. Instead I collect cookbooks. Relatively inexpensive and something I use every day. Whenever he starts to comment I remind him, oh so gently, that his life is greatly enriched by the fact that we are surrounded by so many wonderful books with so many wonderful recipes and so much of the wonderful food I make comes from these wonderful books. 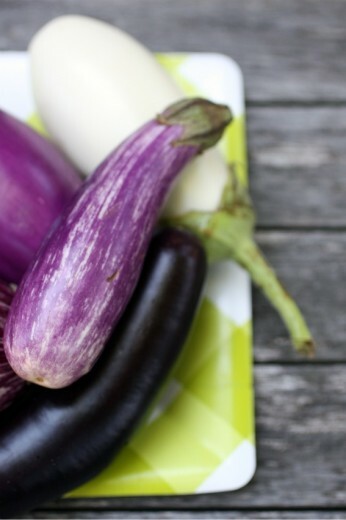 Tonight our dinner came from one of my newest acquisitions – Purple Citrus & Sweet Perfume. 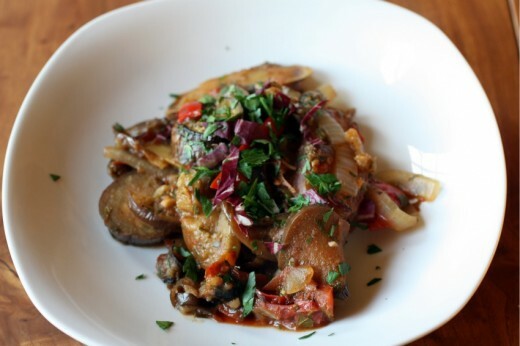 The book was written by the chef of an Eastern Mediterranean restaurant in London’s Mayfair neighborhood. In bookstores, I pick up Mediterranean and Middle Eastern cookbooks all the time – those are the cuisines I miss most from our year in London and is difficult to find decent restaurants in Seattle. Most of the books I peruse have too many meat dishes for me to buy them. Although this book has a meat and poultry chapter, as well as one for fish, there are still so many tempting recipes for me to try in those pages. And not just mezze. I tell you this because the book happened to be sitting near us as we ate and Randy put down his fork (put down his fork! ), picked up the book (picked up a cookbook! 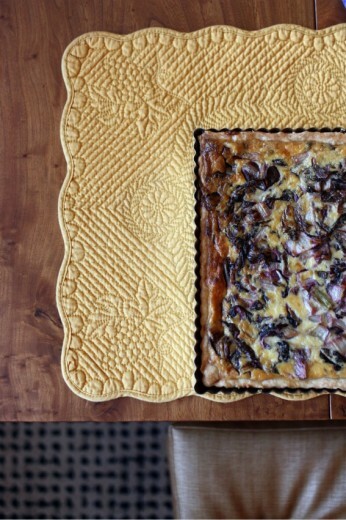 ), and started reading through the recipes, voicing aloud the ones that sounded good to him (!!!). In other words, this dish was that good. If you know Randy, and if you read here often enough you probably feel like you do, unsolicited praise means a dish is out of sight. Actually picking up a book and requesting dishes to be made out of it it is unheard of. This pilaf is the third thing I have made out of the book (the soup I made last night is next up on the blog), and all have been incredible. And in need of serious tweaking. I’m not sure if this is the result of a restaurant chef writing a home cookbook or if something happened when the British measurements got transcribed into American ones, but if I didn’t know a thing or two about cooking, I probably would have thrown the book across the kitchen in frustration. Of course, I am far from an expert about this kind of cuisine, but I do know that 1½ cups of rice and 3 ounces of pasta will need much more than 2 cups of liquid to turn out all right. So, I’ve tweaked. And I’m giving you the tweaked recipe. I changed the proportions, I used spaghetti instead of vermicelli (angel hair is what I normally use but my little market up the street didn’t have it and what’s more, we both liked the thicker strands of pasta in there). I added spice where there was none and some additional shallots. 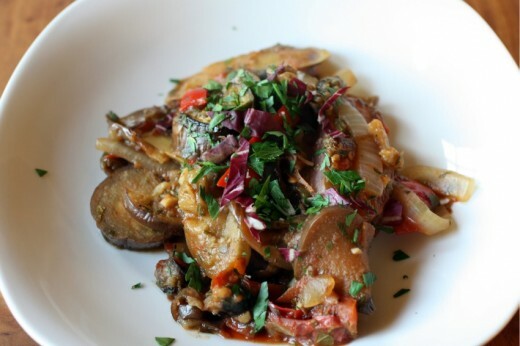 This dish is probably meant to be a side dish along side some lamb or chicken. We ate it as a main course alongside the previously mentioned soup and some perfect steamed green beans. 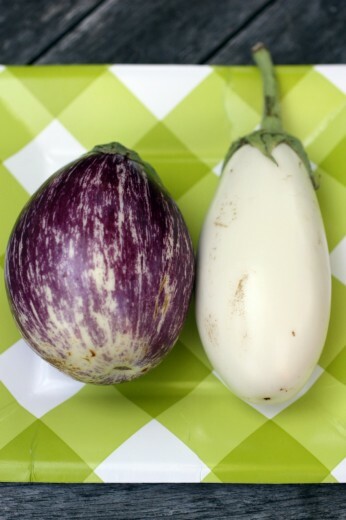 The author says it is street food, Turkish-style. Both Randy and I say it is food we could eat everyday and be completely happy. I have a large spice cabinet and I actually have something called Turkish spice mix, bought at a farmers’ market. This dish needs something so, assuming you do not have Turkish spice, you can add pinches of cumin, coriander, even a bit of curry. Fennel would be fine too. And lots of black pepper. Heat a large saucepan over medium heat. Melt the butter, then add the shallots and a large pinch of salt. Sauté, stirring frequently, until starting to turn golden, about 4 minutes. Stir in saffron and the spices. Add the vermicelli and stir continuously until the pasta starts to turn golden. It burns easily so be careful. Add the rice, chickpeas, and apricots and stir to coat the rice with the fat and the spices. Pour in stock (or water) and bring to a boil. Reduce to a simmer and cover with a lid. Cook over low heat for 20 minutes. Check for water a couple of times as you might need to add more. 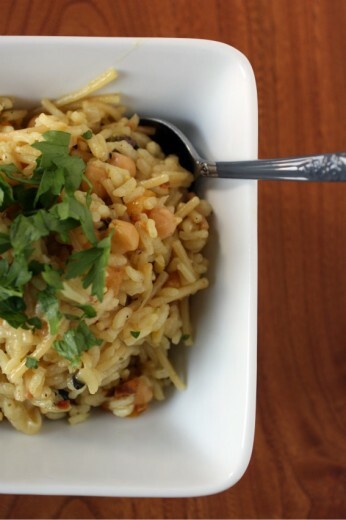 When the rice is tender, add the pistachios and turn off the heat. Cover the saucepan with a clean kitchen towel and replace the lid. Let stand for 15 to 20 minutes – this will allow the the rice to cook further and become more fluffy. One more thought: My dish was not particularly fluffy. I didn’t mind, it was stick to your ribs hearty which is nice for a main course. 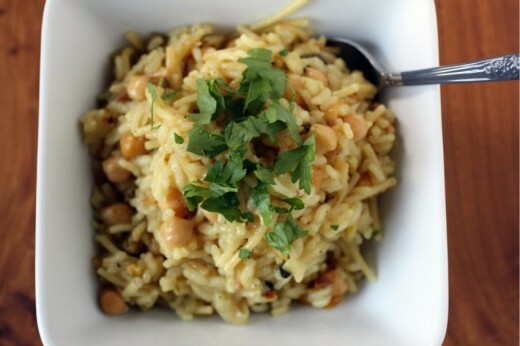 Arborio rice, the one that was called for in this recipe and which is also used to make risotto, is starchy and heavier than a basmati. 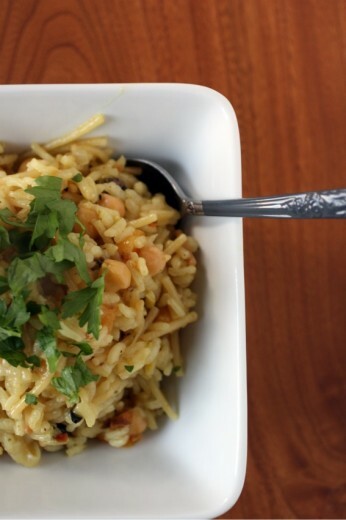 I imagine that if you use basmati or jasmine, you will end up with a fluffier pilaf. Let me know if you try? 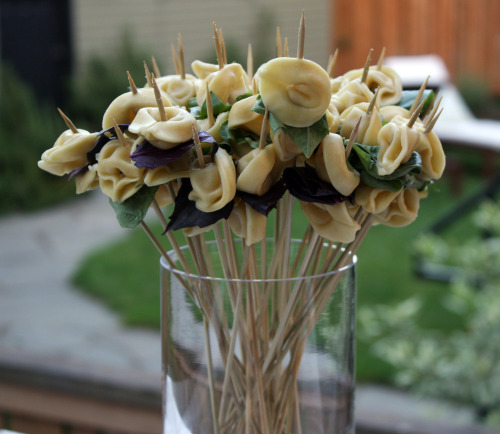 Tortellini Skewers are great for any party. I made these recently and I stuck a cherry tomato on there as well. 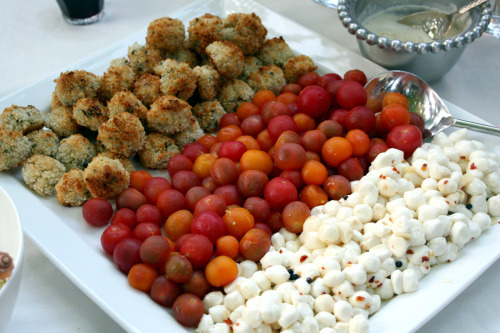 Little balls of food are always welcome at a party, especially if it is marinated mozzarella. 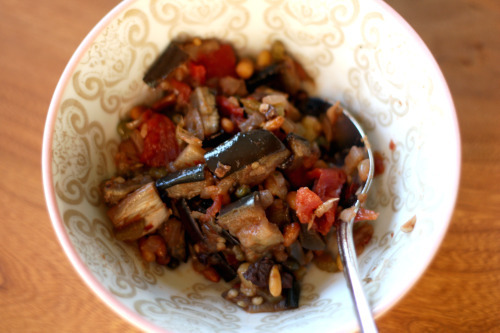 Eggplant Caponata is good for groups large and small. 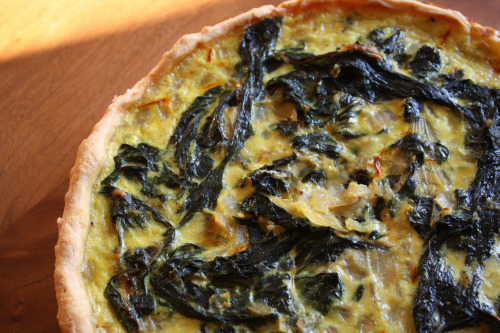 Serve it with crackers, baguette slices, or your favorite carb. 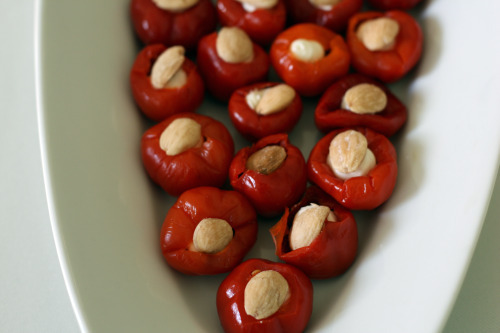 These little cheese stuffed Peppadew peppers are one of my favorite things to make for gatherings large and small. I always get raves and lots of comments about them. If you are a CSA member, chances are you are getting a lot of chard and will get a lot of chard in the coming months. 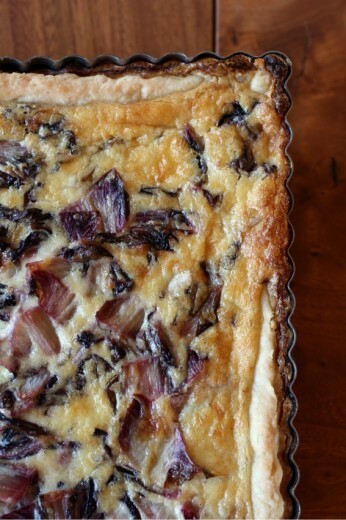 This tart is a delicious way to make your way through those bushels. By the time you read this post, I will be long gone. It’s the end of August and that means, every other year, that we are in Sun Valley with my parents. This is a sweet trip for me. I have been going to that lovely mountain town since I was 11 years old. When I was younger, it was hot days and cold nights, hours spent at the pool, horse back riding, river rafting, time spent with camp friends, and teenage boys who were my crushes. Nowadays it is hot days and cold nights, hours spent at the pool, going on slides at the playground, splashing in the town fountain, time spent with my family, and very young boys who are my children. My life has changed plenty, Sun Valley is mostly the same. The inspiration for this dish was ingredients on hand, plus a long-ago cut out recipe for a pasta with Brie cheese to make it creamy. It is best to remove the rind in this dish. If you Brie is super soft, just pop it in the freezer for about 10 minutes and it will slice right off. I also had a blue cheese in the refrigerator and I contemplated using that in the pasta instead of the Brie. Finally, the “stuff” to pasta ratio is high here – you could bulk up the pasta to feed more people and leave the “stuff” the same. Preheat the oven to 400ºF. Place the cherry tomatoes on a small baking sheet and drizzle with a bit of olive oil. Sprinkle with a pinch of kosher salt and a few grinds of pepper and, using your hands, mix well. 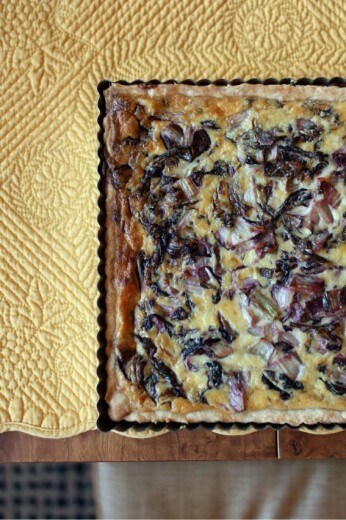 Pop in the oven and roast for 20 minutes. Remove and scrape into a large bowl. Meanwhile, heat a medium skillet over medium heat. 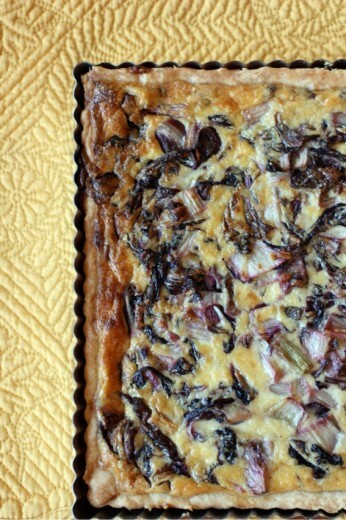 Pour in just enough olive oil to coat the bottom of the pan and add the shallots along with a large pinch of salt. Sauté, stirring frequently, until soft, about 4 minutes. Stir in the thyme, followed by the corn. Continue to cook until fragrant and the corn is soft, about another 3 minutes. Remove and scrape the corn mixture into the same bowl with the tomatoes. Put the cheese and the basil in there as well. Bring a large pot of salted water to boil. 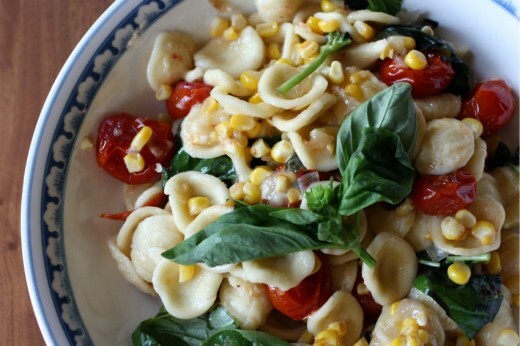 Pour in the orecchiette and cook until al dente, according to the package directions. Taste to make sure. 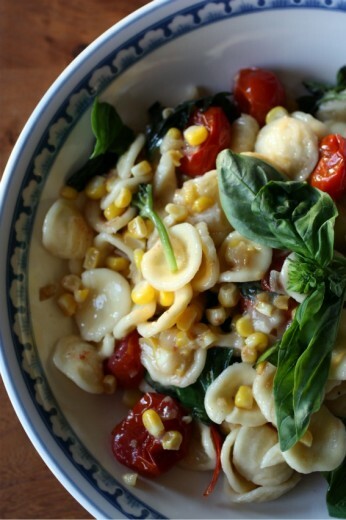 Using a slotted spoon, scoop the pasta into the bowl with the other ingredients. Stir gently, adding some of the pasta water if it seems to dry.